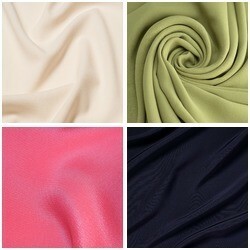 Crepes in either silk or polyester are amongst the drapiest of all dress fabrics and are mostly medium weights. They are very popular for figure-hugging, flowing or clinging styles of bridal gowns and bridesmaid dresses, special occasion and elegant evening gowns. Peachskin or sandwashed crepes are also one of the softest feeling dress fabrics. Satin-back Crepe is a reversible fabric allowing many useful effects when both sides are combined in the same garment. Silk 'Marocaine' crepe is French for 'Moroccan Crepe' and is sometimes spelt 'Marocaine' or 'Morocain'. 'Moss' crepe has a more textured surface.